So why is the majority of these questions about the US and not the world? I thought you were an organization that deals with world hunger. I’m not sure I understand your question. 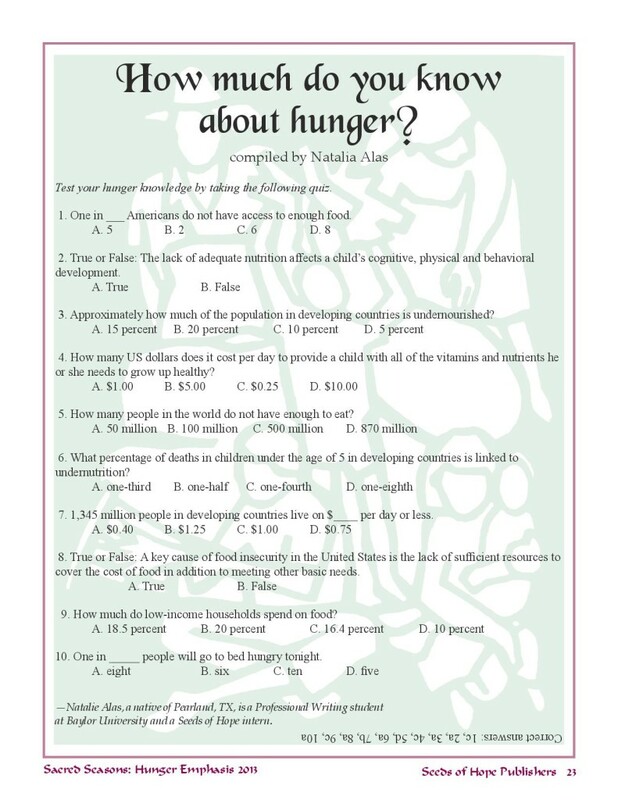 If you are talking about the “Test Your Hunger IQ” page, only three of the eight questions are about the US. Those, however, are last year’s statistics, and we are about to post the 2011 stats. We recently completed the 2011 Hunger Emphasis packet, which we will post once it becomes a back issue. (We feel like that’s only fair to the people who pay for subscriptions to Sacred Seasons.) I’m not sure what we’ll do about the quiz, but we may leave it for now, but post new stats in those widgets. We’ll be glad to email you the new stats, either as a Word document or as a pdf. If you would like to receive them, please send an email seedseditor@clearwire.net. Thank you for your interest in hunger issues.